An assault charge is a serious matter, and there are many different degrees of assault depending on if the matter involves a family member, child or elderly person but in all cases a conviction can have severe and lasting consequences. If you’ve been charged with assault, hiring an experienced Portland assault defense lawyer is your best hope – and your only realistic option – for successfully protecting your freedom and your future. Portland assault defense lawyer David McDonald has more than a quarter-century of experience defending people accused of assault. He will put you in the best possible position for a favorable outcome to your case. 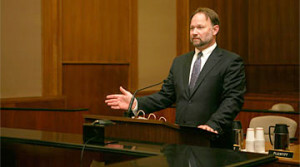 Whether an assault charge is generated by a bar fight, a domestic quarrel, a dispute with neighbors, an injured child or some other incident, David McDonald has handled similar cases for clients in both Washington and Oregon. He will first look for reasons to dismiss the assault charge through a variety of means including civil compromise for minor assaults, or to have it reduced to a less serious charge. Some misdemeanor and class C felony assault charges can be dismissed through a legal process called civil compromise, where all parties agree on a settlement and the judge, upon approving the settlement, agree that the charges can be dismissed. In Washington, the law uses a common law definition of “assault” which not only includes a physical assault but also threats to inflict physical harm or injury on another. So, in some cases, a person may be charged with assault without actually touching or harming another person. The seriousness of the assault can depend on the nature of the person assaulted, for example the seriousness of the charge can be enhanced if the person claiming to be assaulted was a law enforcement agent, a spouse or a child. on the seriousness of the injury, whether a weapon was used and even whether another person was actually present. Every assault case must be analyzed to determine if the accused person legitimately acted in self-defense or in the defense of his or her home or property. If a judge or jury finds you guilty of criminal assault, a victim may also pursue civil damages against you. Because an assault can result in both criminal and civil liability, your first call should be to an experienced Portland assault defense lawyer who can effectively handle even the most complicated assault case. Portland assault defense attorney David T. McDonald believes that every defendant accused of assault deserves an aggressive, effective defense. In Oregon, David McDonald represents clients in Portland and in Washington, Clackamas, and Multnomah counties. In Washington, he represents clients in Clark County and throughout the state’s southwest region. He also works with Spanish-speaking investigators and interpreters to represent clients in the Hispanic community. To learn more or to arrange an initial telephone consultation, call the law firm of David T. McDonald at 503-226-0188. Evening and weekend appointments are available.